A reader of books and articles on the wines of the Mosel will get the impression that winegrowing starts at Konz, just south of Trier, where the Saar flows into the Mosel, and continues downriver to Koblenz, where the Mosel meets the mighty Rhine. This is because most wine writers have only noted this area in passing, if at all. The Upper Mosel—Obermosel in German—has a very long history of winegrowing. The vineyards are planted from Konz to Perl, in the tri-border region of Germany, Luxembourg, and France. There are, however, natural and artificial differences between the more well-known Mosel Valley wines and those from vineyards upriver from Konz, where the terrain is somewhat different from the steep slate slopes of the Middle and Lower Mosel. As with other wine regions in Europe, the borders follow those of regions or states. These borders are often defined by rivers. On the Loire, for example, Sancerre belongs to the Centre region, but Pouilly-Fumé, on the opposite side of the Loire River, is a part of Burgundy. On the right bank of the Rhine, Rheingau is in today’s state of Hesse, whereas Rheinhessen, located across the Rhine on the left bank, is in Rhineland-Palatinate. Likewise, the Mosel River acts as a natural border between the vineyards of Germany’s Upper Mosel and Luxembourg. On the Upper Mosel, the wines made on the German side of the Mosel River are labeled as “Mosel,” just like the more famous wines downstream. Yet they are referred to as Obermosel. Crossing the Mosel to Luxembourg, you find Moselle Luxembourgoise, and further upstream, the French have AOC Moselle. As in Germany, France has some unofficial subregions here, too. Val de Sierck is the tri-border area of France, Luxembourg and Germany, and further upstream, just around the city of Metz, wines are referred to as Pays messin or Côtes de Moselle. The section where the Mosel just crosses into Germany belongs to the state of Saarland and is called Moseltor. Since the 1914 edition of Die Weine im Gebiete der Mosel und Saar (The Wines in the Mosel and Saar Regions) by Friedrich Wilhelm Koch, only recently have wine journalists reported about this area in a serious way. Manfred Lüer writes a chapter about the Upper Mosel in Stuart Pigott’s Weinreisen series (Scherz, 2009). This influenced me to take on this project and is a must-read for anyone who can read German and is interested in Mosel wine. A more academic and important source is Otmar Werle’s Das Weinbaugebiet der deutsch-luxemburgischen Obermosel (The Wine Region of the German-Luxembourg Upper Mosel, 1977). Before we lay out the history of the Upper Mosel, which differs from the better-known areas downstream, we should write a word or two about the geology and topography. If at Konz you choose to follow the Mosel River south (i.e., upstream), you will soon see that the landscape is somewhat different. In this part of the Mosel Valley, the hills are, in most parts, less dramatic and steep than you will typically find in many areas of the Middle and Lower Mosel. Furthermore, the river course is straighter than the Middle Mosel’s, and the soil is predominantly shell limestone and not slate. This is the beginning of the Paris Basin, which is like Chablis and Champagne. In fact, the Romans had a limestone quarry in Nittel on the Upper Mosel. Today, there’s even a limestone factory just a couple of kilometers downstream from Nittel in Wellen. Under the Romans, the Moselle was in the province of Gallia Belgica (Belgic Gaul). It was the Romans who gave the river its name Mosella, literally the small Mosa. During the Middle Ages, the area which we could call the Upper Mosel in the wider sense (that is, both riverbanks) belonged to the Duchy of Luxembourg, which was created in the 14th century. In other words, the border ran further east (into present-day Germany) than it does now, so both banks of the section from Perl down to the mouth of the Saar River, near Konz, belonged to Luxembourg. The Saar and Middle Mosel were under the rule of the Electorate of Trier. This is an important fact in wine history, because the Upper Mosel was, therefore, not subject to Archbishop-Elector of Trier Clemens Wenceslaus’s so-called Rieslingsedikt of 1787, which was a regulation to plant more Riesling in the Mosel region. Speaking of the Rieslingsedikt, there is an anecdote quoted by some writers, saying that vintners on the Upper Mosel were condemned and burned at the stake for non-compliance with the regulation. One should keep in mind that the right bank was under Luxembourg rule and that the last witch was burnt at the stakes in 1692. In 1660, the then-Archbishop of Trier stopped the practice. So the historical evidence is weak. In addition, under French rule (1794–1814), both banks remained in the Département des Forêts, while the Saar and Mittelmosel (including the Ruwer) belonged to the Département de la Sarre and the Untermosel to the Département de Rhin et Moselle. During this period, wines from Grevenmacher, on the Luxembourg side of the Mosel, were well respected. A description of all the départements of the French Empire place the wines from Grevenmacher on par with those from Bernkastel-Kues, which are noted as excellent. Only at the Congress of Vienna, in 1815, was it decided to move the German border further west to make the Mosel and its tributary Sauer natural borders. To the west, Luxembourg was included, together with what is today Belgium and the Netherlands, in the United Kingdom of the Netherlands under Dutch rule and the right riverbank came to the Grand Duchy of the Lower Rhine (Großherzogtum Niederrhein) and then, in 1822, to the more famous Prussian Rhine Province. These borders have lasted to this day. Fifteen years after the Congress of Vienna, the Belgian Revolution started, and Luxembourg sided with the Belgians. Belgium won its independence from the Netherlands in 1839, but Luxembourg remained in a personal union, with its own constitution and the Dutch King as its Grand Duke. Three years later, Luxembourg joined the German Customs Union (Zollverein), which meant that Luxembourg products could be sold freely in Germany, a predecessor to the European Union. Let’s pause the story here and take a look further upstream. Just south of Luxembourg, in France, lies the commune of Haute-Kontz (Obercontz) in the canton of Sierck-les-Bains, which I would say does belong to the Upper Mosel, with similar soil types and wine styles. Henri Schliep’s 1910 Mosel and Sauer map (see photograph above) of the Upper Mosel and Luxembourg includes the vineyards on the Lorraine side of the border. These communes belonged to Luxembourg till the mid-17th century. They were then ceded to France and have since then been a part of the province of Lorraine. Upstream from here, the Mosel River flows from its source in the Vosges Mountains. And, some 50 km upstream from Sierck, just after Metz, there is another wine district, albeit very small today, which partly shares its rich and long history with the greater Upper Mosel—Côtes de Moselle. Between 511 and 751 Metz was the capital of the Kingdom of Austrasia, which was, of course, important for viticulture. The poet Venantius Fortunatus visited the city and the royal court in the mid-seventh century. He then took a boat on the Mosel down to Andernach on the Rhine near Koblenz, which he then described in a poem De navigio suo. The wines made around Metz were consumed locally till the 1880s. In a comment in 1833, Cyrus Redding puts them next to the German Mosel wines. In the summer of 1870, France declared war on Prussia. The Prussians counterattacked southwards from the Rhine Province into the northern part of Lorraine and then marched westwards. On September 1, the Emperor Napoléon III was captured after the Battle of Sedan and the Franco-Prussian War officially ended with the Treaty of Frankfurt in 1871. The newly founded German Empire wanted to create a buffer to the west by incorporating mostly the German-speaking regions of eastern France. Under the treaty, the regions of Alsace and Lorraine, including the département of Moselle, became a part of the German Empire and formed the Imperial Territory of Alsace-Lorraine (Reichsland Elsass-Lothringen). The territory remained under German rule until the end of the First World War, when it became a part of France again in 1918. One caveat: there is another winemaking district even further upstream near the city of Toul and under the AOC Côtes de Toul. Though Toul is situated on the Mosel River, its vineyards are closer to the Meuse River and thus do not label their wines as Moselle. This part of the Lorraine was not under German rule between 1871 and 1918. The region is famous for its vin gris, a rosé wine. After the peace in 1871, the conquered wine-producing districts could sell their produce duty-free to Prussia, which was, by then, a net importer of wine. Apart from the legal framework of free trade, transports were developed through the construction of railroads. One decisive factor for the German victory in 1870 had been the efficient transport of troops and supplies, so many resources were now allocated to expand the rail lines further for defense purposes. This had secondary positive effects on the Mosel wine trade. The Trier-Luxembourg line had already been opened since 1859 and, in 1878, the Trier-Thionville-Metz on the right bank of the Mosel was inaugurated. In this section, the stations of Perl and Wincheringen were important for export for Luxembourg’s wine production. The railroad also had an impact on the labor force— many young men in traditional wine-producing villages on the German Upper Mosel started to commute to the steel factories in Thionville and Hayange (Hayingen), both in Lorraine. In the second half of the 19th century, and especially after the economic upswing of the Gründerzeit, there was a growing demand for wine in Germany, such as the Moselwein-Modewein movement, which went beyond Germany (see, for instance, my article “Mosel Wine in Sweden”). This demand had implications first on the Middle Mosel, Saar, and Ruwer and, to some extent, the Lower Mosel, where demand for classical Mosel wine increased all over Germany. As for sparkling wine, we can look first at the history of Champagne itself. If the French invented Crémant, it was the Germans who succeeded to make a business out of it. Already in the first half of the 19th century, many German families emigrated to the Reims area, including the Krugs, the Bollingers, the Heidsecks, and the Mumms. Germans were introduced to sparkling wine during the French occupation of the Rhineland from 1795–1814, when the troops brought it with them. After the Napoleonic Wars, production started in various regions of the German Confederation (a loose association of 39 German states which was created after the Napoleonic wars and lasted till 1866), not only in the old occupied territories. But the axis was on the Rhine. In 1850, the German Confederation had 50 production facilities, which produced 1.2 million bottles a year. This habit took off with the industrialization after the Gründerzeit: in 1885 there were 150 factories which produced 6 million bottles and in 1903 there were 225 factories which produced 11 million bottles. Some of the emigrants to Champagne returned to Germany and introduced the product there. Germany would later become a large consumer of sparkling wine, called Sekt or Schaumwein. It was so popular, that, in 1902, the Reichstag voted for a law to levy on the sale of sparkling wine, known as the Schaumweinsteuer, in order to help finance the German Navy. Germans are still big consumers of bubbly even today; every fifth bottle produced in the world is consumed between the Rhine and the Oder. This demand had, of course, implications on the structure of production on the Upper Mosel. As has been mentioned above, there had been no Rieslingsedikt, so the production was still focused on Elbling. Furthermore, transports were dependent on the waterways and here the Upper Mosel, being further upstream from the Rhine, had a clear disadvantage to its neighbors further downstream to produce and market quality wine. Hence, quantity was emphasized. Up until the rail line was built, the produce had only been for local consumption. Though the vineyard area grew considerably between 1880 and 1900. In Luxembourg, we could even speak of a wine bubble. All possible land where vines could be grown was used, and the viticultural area peaked in 1920. And almost the entire production, including pressed grapes, was exported to Germany. The French communes of Contz-lès-Bains, Sierck-lès-Bains, and Haute-Kontz were part of this market as well. In 1898, a Prussian civil servant mentions that this section of the Moselle only produces white wine in quantity, with up to 100 hl/ha or more. When we move further upstream to Metz, we see the same pattern during this period. This area has a long wine-producing history that goes back to the Romans and then the medieval Merovingians. In the 19th century, only red varieties were cultivated here. When German demand reached this area after 1871, the focus was on the production of blanc de noir, or German Rotkäppchen. Not only German wine merchants but also producers of sparkling wine moved in, like Kupferberg in Ars-sur-Moselle and Deinhard in Vaux and Moulins. Even producers from Champagne wanted access to the German market and sought to establish themselves in this part of the Mosel region. Up until 1910, when the AOC Champagne was created, wine producers bought pressed grapes from Lorraine. Sadly, the First World War put an end to this. The region also suffered from early outbreaks of phylloxera in 1866. As a response, the Germans founded the Weinbau-Institut Laquenexy in Metz in 1902. Its founder, the Swiss agronomist Alexander Georg Wanner (1869–1919) crossed many local varieties and created the local grape Auxerrois, which is only grown in Luxembourg, the Upper Mosel, and Toul today. It is also worth mentioning that from 1892 till the outbreak of the First World War, the Champagne producer Eugène Mercier, who liked to market his wines, had a sparkling wine factory in the city of Luxembourg, near the train station, called Fabrique de Champagne E. Mercier et Cie, Luxembourg. It employed 85 full-time workers. The base wine was imported to Luxembourg from Champagne and then bottled and fermented a second time there. The wine was then labeled as Champagne. This activity was referred to as Grenzfirmen (border firms) and Grenzschaumweine (border sparkling wines). This practice was due to tariffs, as Luxembourg was a member of the Zollverein, which had substantial differences in the rates for the base wine and bottled sparkling wine. The business grew to such an extent that the German sparkling wine factories had internal competition and formed a trade syndicate to lobby for more protection through laws and tariffs. By the way, the wine author Karl Heinrich Koch was the first Syndicate secretary. The Treaty of Saint-Germain-en-Laye, signed in 1919, had drastic implications on winegrowing and trade in these districts. New national borders meant that old trade patterns became obsolete and, therefore, the developments were very different. This was an economically integrated region that was now broken up through national borders, customs duties, and different currencies. All German officials, even the staff at Laquenexy, were deported. Sons and daughters of vintners then had opportunities to work in public service. Once the Moselle Département returned to France, consumption patterns changed in favor of wine from the South of France. At the same time, the German market disappeared rather quickly due to customs tariffs, and even more by the hyperinflation in Germany’s Weimar Republic from 1921–24, when the German Papiermark, or mark, had a disastrous effect on prices of all imported goods, such as wine from France. This sad development is caught in the statistics. In 1898, there was about 5,700 ha of vineyard in the Département de Moselle, which decreased to 3,600 in 1922. Just before the Second World War, the area under vine went down to 1,500 ha, which was more than halved in 1959. Today, there is only 35 ha of cultivated vineyard land. Ever since the 1880s, the Luxembourg steel industry was integrated with its counterpart in France. It was the most important industry for the national economy. After the First World War, the Luxembourgers had a referendum to vote on joining an economic union with either France or Belgium, since the Versailles Treaty put an end to the Zollverein. The result was an overwhelming majority for France. The French, however, were not interested in signing any agreement with Luxembourg, so the second choice became a reality, much in line with the winegrowers’ vote. This was instrumental to winegrowing in Luxembourg. Had Luxembourg joined an economic union with France, its viticulture could have shared the same destiny as in Lorraine. After the war, the Luxembourg government led a successful restructuring policy with a focus on quality. Between 1924 and 1929, the total vineyard area was reduced by a quarter. This was due to a program of subsidies to cut down vines. In 1925, the Institut Viti-Vinicole was founded and, in 1935, the official classification system was created and three classes—the Marque nationale—were introduced. Another successful policy measure was to form five cooperatives. Today, these have been united under Domaines Vinsmoselles and account for 58 percent of the total production in Luxembourg. And one should not forget the demand side either: Luxembourg was relatively rich and became even wealthier during the 20th century. The main export market was Belgium with its population of bons vivants. So from a situation of having their wines sold in bulk, Luxembourg began producing better quality wine that was consumed at home and in Belgium. Today, two-thirds of Luxembourg’s wines are consumed locally. The main export markets are still Belgium and the Netherlands. Since 2000, Le Guide Hachette has a separate section on Luxembourg. A good starting point to illustrate the situation is the 1910 Mosel & Sauer viticultural map by the German-Luxembourg cartographer Henri Schliep, which I mentioned above. It was inspired by the 1906 edition of Clotten's Saar and Mosel map, which has the same scale 1:50,000 and the same colors for the different tax brackets. As laid out under Luxembourg and France above, 1910 was in the middle of an expansive period for wine production in the region. And yet, on the map, the vineyards on the right (German) bank are scarce and are all rated in the lowest tax category. The Treaty of Versailles implied that Germany lost 20,000 ha of vineyard in Alsace-Lorraine. There was also a transition period of free trade in wine from Luxembourg for five years. The Germans were and still are large consumers of sparkling wine. After 1918, the Upper Mosel had its first serious chance to find a market for its produce. There are no statistics on the growth of the vineyard area on the right bank from 1919. It was only split up among the Obermosel, Mittelmosel, and Untermosel in 1954. We know from Friedrich Wilhelm Koch that the Obermosel had 420 ha of vineyards in 1914. Estimates from Werle give us 550 ha in 1930, 680 ha in 1940, and 905 ha in 1968. Despite the demand and loss of vineyards, there was no major capital inflow and no new cooperatives here. In other words, the properties remained small and in family hands. A business model prevailed with no incentive to produce high-quality wine. The growers pressed the grapes and sold the must to Sektkellereien (bulk sparkling wine manufacturers) in other parts of Germany. No wine was made, despite a trained workforce at hand. Up until then, most German winegrowers had worked in Luxembourg. With the new border controls after 1919, it became more difficult to work there. Werle says that bulk production is about the same as in 1977. In Loeb & Prittie's Moselle, Nittel is supposedly the only place where the village name was put on the labels of this area. Lüer says that the German growers on the Upper Mosel were influenced by their Luxembourg neighbors in the mid-1990s and started to plant, apart from Elbling, the same grapes, like Pinot Gris and Auxerrois. Today, the total area under vine is about 800 ha compared with 1,200 ha in Luxembourg. 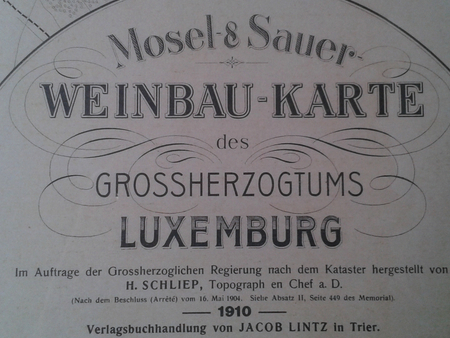 Photograph of Henri Schliep’s 1910 Mosel & Sauer map. Very informative and well written article. As you mention, very little has been written about this part of the Mosel (particularly in English). Unfortunately, very few of these wines make it to the U.S. Except for the occasional Clos des Rochers. Thanks for reminding me that the Mosel is so much more. In another thread, I mention the different old maps, including the Mosel & Sauer map. Joachim Krieger pointed out to me that Riesling was planted less in the southern Mosel region, because Riesling lacked sufficient ripeness and had a harder acidity from the shell-limestone soil, hence Elbling. The slate soils, on the other hand, provided more warmth for the vines and the acidity tended to be riper. Today, of course, this is no longer the case with climate change. The Upper Mosel can produce ripe Riesling grapes, like in Alasce and Rheinhessen’s Wonnegau, which also have limestone soils. Uwe, glad to hear that you liked it. Lars, does Joachim have any reference for that statement? Werle, who is a university professor in geography (the book on the Obermosel is based on his PhD thesis), does not mention the soil. His reasons for the situation on the right bank of the Obermosel are 1) the peripheral location in Germany 2) lack of transports 3) lack of investments (private as on the Saar or public as in Luxembourg) 4) the harvest was sold directly to the Sektfactories once pressed. These factors implied bulk wine production of Elbling, which gives larger volumes than Riesling. I’ll add to Uwe’s comments regarding American availability of these wines. In recent years, I was able to buy the Clos des Rochers Auxerrois in the US a couple of times; definitely an interesting wine, and worth trying for under $20. The last vintage that I had was 2008. Many Alsatian Pinot Blancs are predominately Auxerrois, of course. (Andrew Jeffords had a good article on this earlier this year on the Decanter website.) A few years back, I saw a couple of other Clos des Rochers wines in upstate NY; pretty sure one was a Pinot Gris, and maybe a Riesling? The only other wine that I’ve had or seen from this region around here was a 2008 Mathias Dostert Roter Elbling Tafelwein Trocken “Rosay” from the Nittel area. Not much more than a curiosity in my opinion, and my only encounter to date with any form of Elbling. VOS Selections in the NY/NJ area imports Château de Vaux – never seen the wines, though. Thanks for your comment, Andrew. Several years ago, when I first started at Mosel Wine Merchant, I considered importing wines from the Obermosel and Luxembourg, such as Clos des Rochers, which I sampled bottles of at the time. Yet I just wasn’t interested enough. My focus was on Mosel wine from slate. By the way, I didn’t know that Clos des Rochers and Château de Vaux were imported in the US. Happy to hear that you liked it Andrew. Yesterday I was invited at a friends house for New Year’s day drinks and I was served the Rosé Crémant from Clos de Rocher. Highly recommended. As to Pinot Blanc, I would like to point out that in Alsace it is a name for a blend of Auxerrois and the varietal Pinot Blanc. On the Mosel it is only known as the single-grape wine Pinot Blanc which is less aromatic than the Auxerrois. By the way, I just read on fellow subscriber Uwe Kristen’s Facebook page that, according to Francois Steichen, “Bernard-Massard has ceased exporting.” This includes Clos des Rochers in the States. Thanks for the update, Lars. Too bad to see them go. On a recent visit to the Upper Mosel/Luxembourg, a couple of producers said that Elbling (Kleinberger) goes back to Roman times and was popular for the Sekt industry, hence few grape growers bottled their own wines. Some edits have been made today: Friedrich Wilhelm Koch covered the Obermosel and Luxembourg 1914; A section on the Champagne Border firms (Grenzfirmen) in Luxembourg; Vineyard areal on the German Obermosel 1914, 1930 and 1940.